Osteoarthritis (OA), also known as age-related arthritis or degenerative joint disease, is a deteriorating disease that affects the joints in your body. It can occur in any of your body’s joints, including the knees, hips, shoulders, and wrists. Knee osteoarthritis occurs when the cartilage that surrounds the bones in the knee joint is worn down. As a result, the bones in the joint begin rubbing together, causing inflammation and pain. Commonly seen in older patients, this disease tends to develop as you age and worsens over time. Knee osteoarthritis can cause knee pain that may range from dull, achy, sharp, or even debilitating, depending on the location and severity of the condition. What are the symptoms of knee osteoarthritis? Diagnosis begins with your doctor conducting a thorough physical exam, which includes examining the range of motion and function of the knee. In addition, your doctor will analyze your personal and family medical history to help make an accurate diagnosis. X-rays are often taken in order to identify certain abnormal characteristics of the joints, such as narrowing of the cartilage. In cases where an x-ray is not detailed enough or your doctor finds it is necessary for further testing, an MRI or CT imaging scan may be used to evaluate the knee more closely. In addition, blood tests may be used to rule out other health problems like rheumatoid arthritis and other conditions that cause joint pain. What is involved in osteoarthritis knee treatment? If conservative treatments fail to improve the function and discomfort in your knee, you may be a candidate for surgical treatment. 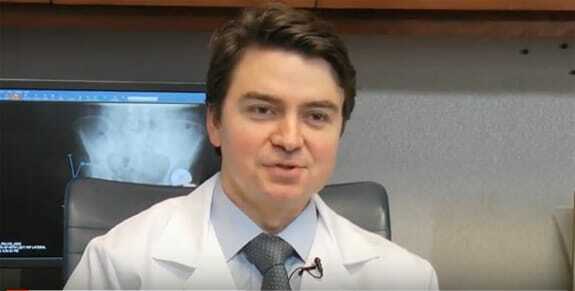 Dr. Peter K. Sculco is dedicated to providing patients with advanced treatment options using the highest quality implants and latest surgical techniques. If you’re suffering from knee pain caused by knee osteoarthritis, the first step to restoring your mobility and quality of life is scheduling an evaluation with an experienced orthopedic knee specialist. Dr. Peter K. Sculco provides personalized care paired with world-class orthopedic training. Call 212.606.1771 today or fill out the form on this page to request an appointment.